The information that is gathered during these marine geoscience expeditions contributes hugely to our knowledge and understanding of how the Earth evolved and is still evolving. It underpins our models of climate change, the emplacement of valuable minerals and the distribution of natural hazards in both space and time. It is important and valuable work and very exciting to be (literally) at the cutting edge of this research! As I write, the slowly rotating drill bit is cutting into the past nearly 3 kilometres beneath my feet – through 2.1 kilometres of water and 800metres of increasingly lithified (solidified) sediments. What is now coming up in the cores is so compacted and hard that it has to be cut with a saw once it arrives in the core lab. It is really fascinating to see the core split open and see this material that no human eye has ever seen before. The palaeontologists looking at the micro- and nanofossils have been dating the rocks and we are now around 10 million years back in time! Every minute of drilling is pushing this number further and further back. 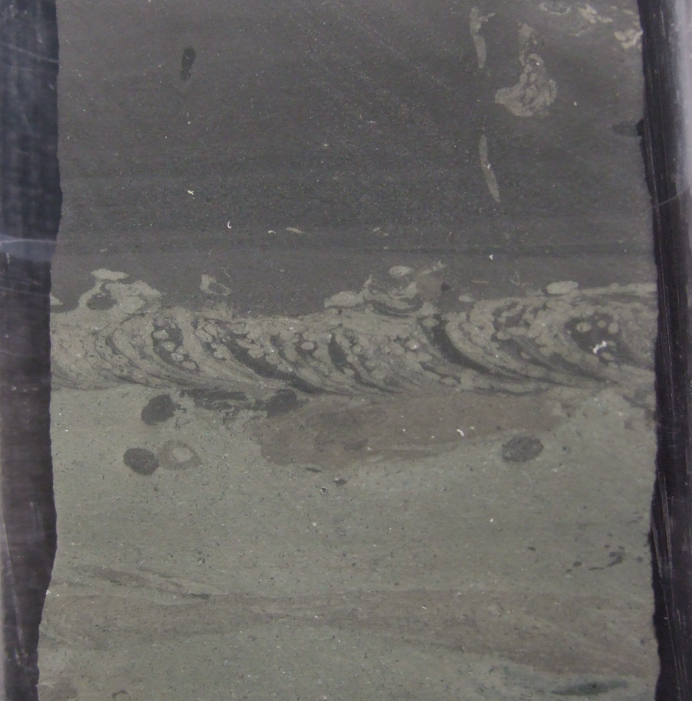 Looking at the sediments is like a form of time travel. It makes me realize why I find geology so engaging. It is all about stories. Each new core has a narrative that geologists have to interpret. So many of the things you may have seen in a geology textbook are there – cross-bedding, faults, folds, bioturbation, burrows and layers of ash and minerals. But these things are not just interesting in terms of the history of the Earth that they display. They are also very beautiful. Some layers are delicate, with fine grained material gradually fading through many and varied shades of grey with bluish to greenish tinges – just like an artist’s palette – decorated with whirls and streaks. Some are spotted with minerals or coarse ash. Some layers suddenly sparkle with the golden flash of sulphides while others are criss-crossed with dark layers that make the lighter hues stand out. The delicate cross-bedding, laminations, faulting and folding in these fine sediments are miniature copies of the larger structures I have seen in cliff and quarry outcrops; and as with these larger structures, every single geological presentation is unique – just like the people of the world whose outer individuality is representative of the internal genetic instructions written in their DNA, these sets of geological features are individually representative of an underlying set of instructions controlled by the specific geographical and climatological interplay occurring at the time of deposition and beyond. The beauty goes deeper when samples are taken and put underneath microscope slides so individual particles can be seen. Their varying colours and shapes also represents a structural beauty, and a deeper symmetry that becomes truly apparent only when they are chemically analysed. All scientists see this beauty in nature, be they physicists, biologists, mathematicians, astronomers, chemists or Earth scientists, and the deeper we dig into the true nature of our chosen field, the more engaging it becomes.